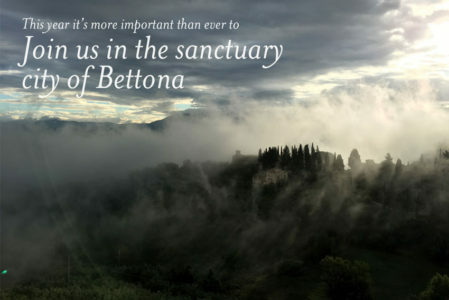 This year it’s more important than ever to join us in the sanctuary city of Bettona. All are welcome to explore our beautiful town. Our (recently restored) town gate will remain open 24 hours a day. No lines, no showing identity cards or passports. Our many churches and chapels even welcome women. (No need to pin a tissue to your head either.) Bars will happily serve anyone at our counters. (You will also not be persecuted for ordering a cappuccino in the afternoon, so order away.) Restaurants even welcome non Italian speaking people. As long as it’s Italian, that is. But that’s why you’re coming in the first place. Extraordinary food just about everywhere you turn. No, I mean it. Join us for wonderful outdoor markets, great local restaurants, and some of the best wine in Italy. And the food back at the palazzo ain’t bad either. Join us for a culinary tour, a cooking lesson, or just for dinner. You won’t be disappointed.